Finally, I got around to buying my own domain name last week - chaitanyagupta.com. I wanted to do it for the past several months... but laziness always got the better of me. Not this time, though. A cousin of mine who wanted to build a greeting site (and buy his own domain for that) finally prompted me to get one for myself. Also, the week long holiday really helped. 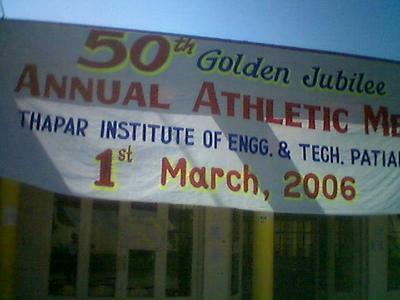 ...TIET celebrated the 2500th anniversary of its famed Athletic Meet on 1st March. Damn Good. Forgot to mention this - who was the "chief guest" at the event? Well, who else, but the first person of Indian athletics - Milkha Singh.